A planet four times the size of Earth may be skirting the edges of the solar system beyond Pluto, according to new research. Too distant to be easily spotted by Earth-based telescopes, the unseen planet could be gravitationally tugging on small icy objects past Neptune, helping explain the mystery of those objects' peculiar orbits. The claim comes from Rodney Gomes, a noted astronomer at the National Observatory of Brazil in Rio de Janeiro. Gomes presented his recently completed computer models suggesting the existence of the distant planet at a meeting of the American Astronomical Society in Timberline Lodge, Ore., earlier this month. 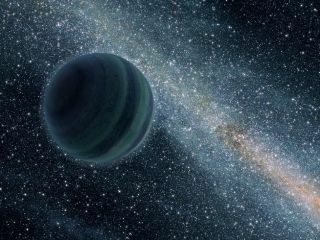 Astronomers who attended the talk find Gomes' arguments compelling, but they say much more evidence is needed before the hypothetical planet can be crowned as real. Sedna, for example, swings around the sun in an extremely elongated orbit — tracing out a very long oval. "Sedna's orbit is truly peculiar," said Mike Brown, an astronomer at Caltech who led the team that discovered Sedna in 2003. Several planet types could fit the disturbances seen in Gomes' calculations. For example, a Neptune-size planet, about four times bigger than Earth, orbiting 140 billion miles (225 billion kilometers) away from the sun would influence the anomalous objects in the observed manner. Or, a Mars-size planet with a highly elongated orbit — but one that always kept it well beyond the orbit of Pluto — could yield similar results. As for how it got there, the planet could have been born in and expelled from a distant star system and later captured by our sun's gravity, Gomes said, or it could have formed near our sun and gradually been thrust outward through gravitational interactions with the other planets. Though Gomes' work has not yet been peer-reviewed, his colleagues are confident he got the math right. "[Gomes] is very good. It's hard to imagine he made a mistake in his calculations," said Hal Levison, a planetary scientist at the Southwest Research Institute in Boulder, Colo.
"Rodney Gomes is actively seeking further evidence and I await his findings with interest!" Douglas Hamilton, an astronomer at the University of Maryland, told Life's Little Mysteries, a sister site to SPACE.com. "He has taken on a difficult task, but is taking the right approach. It is definitely a high risk, high reward, situation — a discovery of a new planet would be spectacular!" New planet or old star? This would not be the first time a planet was revealed by way of its gravitational effects on other celestial bodies. The existence of Neptune was hypothesized at the turn of the 19th century — long before the gas giant was actually seen through a telescope in 1846 — because of the way it was perturbing the orbit of Uranus. "You can go back 100 years to claims of planets in the outer solar system and they've all eventually gone away," he continued. "That should give you pause for thought. Just because there's not a good explanation for [the orbits of the scattered disc objects] besides another planet, doesn't mean there won't be a good explanation in future." Brown, who discovered Sedna, said another plausible explanation for that dwarf planet's strange behavior could be that a star swung near it early in the history of our solar system, throwing it for a loop. "Back at the time of the birth of the sun, the sun probably formed in a cluster of other stars. If true, they would have been close enough together to influence each other's outer planet systems, like where Sedna is," he said. More work is needed to determine whether Sedna and the other scattered disc objects were sent on their circuitous trips round the sun by a star that passed by long ago, or by an unseen planet that exists in the solar system right now. Finding and observing the orbits of other distant objects similar to Sedna will add more data points to astronomers' computer models. "We, and a couple of other groups of astronomers, are working hard to see if we can track some down and figure out this mystery," Brown said. As for the putative planet itself, Levison said, "The strength of the idea that there is a planet out there will be the inability to find another explanation for these objects. But seeing it is the only way to prove it."